At the time of this writing I have lived with a Garmin RV760 LMT GPS for about 24 months. I reported on my experience using this GPS previously. I gave it a “don’t buy” rating at that time. I was pretty harsh about it. Since then I have softened my stance, not because the unit performs any better than first reported–because of map updates it may–but rather because the way it performs may be par for the course among GPS units, or in fact even better. It was my first automotive GPS and with no experience with similar devices I had no frame of reference in that regard–just my hopes and expectations. In my original report I complained of occassional misrouting–the unit sending me needlessly out of the way, giving directions to turn off the only paved road in the area onto dirt roads or where no road even existed… things like that. Such errors are due to erroneous or missing data in the map file stored in the GPS memory upon which the GPS relies, at least that’s what I’ve heard. With each map update, data in the map file is updated and corrected. Over time this should improve the routing accuracy of the unit. That’s one reason map updates are issued. I have also learned that most GPS units rely on the same map suppliers and that the number of map suppliers is small. It includes NavTeq and TeleAtlas, the biggies, and a few smaller players. The implication here is that if the RV760 is issuing poor routing choices at times, then other GPS units will do likewise because they are relying upon the same map data. So, it really isn’t fair to single out any one GPS for making mistakes if the others are going to perform the same way. I think it safe to say that most GPS units do not take into consideration vehicle height, weight, length and width whereas the RV760 does. This is a huge plus over ordinary automotive GPS units. The reason the RV760 considers these vehicle parameters is that while people driving cars can travel pretty much any road without worrying about the weight or dimensions their car happens to be, drivers of larger vehicles such as many RVs have to concern themselves with these things lest they tear the top of their rig off attempting to pass under an overpass with insufficient clearance or fall into a river trying to cross a bridge that can’t support the weight of their rig. Vehicle weight and dimensions are parameters the user enters into the settings of the RV760 once during initial set-up and it then uses that information in conjunction with data points in the map file in order to pick its routing. When more data points are used to pick routes the routing can be more finely tuned, for example to consider the weight and dimensions of a vehicle. On the flip side, when there are more data points there are more places where errors can be introduced into the routing calculations. Incidentally, the unit can store more than one set of vehicle parameters making it easy to move it between vehicles–just select the appropriate vehicle profile in the settings when you move the unit. Most of the routing errors my RV760 has given me appear to have been related to vehicle weight where the GPS had incorrect or absent data in the map file causing it to route me incorrectly. I was able to narrow it down to weight errors by changing the vehicle height, weight, length and width parameters in the settings one at a time and found that changing my vehicle weight from 7.25 tons down to 3 tons or so (closer to that of a typical car) would route me more sensibly at times whereas changing the other parameters to those more closely resembling a passenger automobile resulted in no routing changes. Using this process of elimination I deduced that the map file must have had incorrect or absent data pertaining to the road weight limits of the route. I have learned that in some cases there is nothing I can do while in my vehicle in order to make the RV760 route me the way I want to go unless I change the weight parameter of my RV in the settings to something more akin to the weight of a car. One relatively recent occurrence was that of traveling the Blue Ridge Parkway (BRP) from Asheville, NC to northern VA. The Blue Ridge Parkway is entirely contained within a National Park. There are several campgrounds along the road that accommodate RVs of respectable height, length width and weight. Park employees with whom I spoke were not aware of any restrictions as to taking RVs along the BRP and this includes at least one law enforcement park ranger. The RV760 refused to route me along the BRP from one campground to the next despite the fact it was the shortest route and there were no restrictions that should have prevented it from doing so. There is no workable way of which I’m aware to force it to select a given route that is more than a short distance or without intersections although reducing the weight of my rig in the settings might work in some cases. However, this introduces the possibility that the unit will select an inapproprate route, so, unless I’m sure my weight is OK I don’t like to do this. Consequently, when I tried to use it along the BRP with my rig’s true weight in the settings it would bark instructions to turn off the Parkway at pretty much every intersection along the road even though there was no valid reason for this. Other GPS units which use data from the same map supplier would likely do the same, assuming of course their GPS allowed the user to input vehicle parameters to include when making routing choices. I had the same trouble with the RV760 in another National Park (Grand Canyon) which makes me wonder if the people that create the data base of road information have not been able to successfully extract road data from the National Park Service, which, after all, is a government agency–we all know what that means in terms of efficiency–and one not primarily concerned with roads. So, there are times you just can’t use the unit for routing purposes–other GPS units may be the same!–but it still has value in showing you where you are on a map and if you have the BC-20 backup camera, as a display for the rear view images it produces, second rate as they may be. Much of the time the unit produces acceptable or even ideal routing choices. It has successfully kept me off toll roads for example. It has many other useful features such as the capability to find gas stations, restaurants, etc. that lie ahead on your route. It also shows time driven and time to destination as well as average speed, moving time, standing-still time. It even shows sunrise and sunset times as well as elevation, plus other things which may be of use or interest. 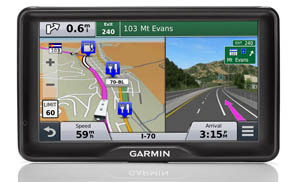 Although on-the-fly routing overrides can at times be difficult or impossible to make on the GPS unit itself, the RV760 works with Garmin’s free Base Camp GPS software, a program for desktop and laptop computers that allows route creation and editing. The last time I looked (which was when I purchased the RV760) I found only one other GPS specific to RVs on the market, the Rand McNally (also sold under the Good Sam name). Does it route any better? I don’t know. As I recall it did not work with a back-ip camera but don’t hold me to that. This is one reason I chose the Garmin over the Rand McNally. I wanted a backup camera and one that was “wireless” making the installation easier. Magellan also makes an RV GPS. It does not appear to have back-up camera compatibility. LMT in the product name of this unit stands for Lifetime Maps and Traffic. Traffic reports included with this unit are limited. For more robust reporting it is necessary to subscribe to a traffic service. That said, not having to pay for map updates is a welcome feature. I continue to use and rely upon my Garmin RV760 LMT GPS and despite its limitations it may be the best option available for RVers. Regardless of the thorough drubbing I gave it in my original report (below) there may not be a better option. I’m still using mine every time I drive. This should be a key takeaway of this report. I have learned that there are times it is not useful for routing; there are other times I need to override its routing choices; there are times that overriding its routing choices is frustratingly difficult, overly time consuming if not plain impossible. It is not perfect, but it is way better having it than not. Considering the importance of selecting routes with sufficient height clearance is reason enough alone to have an RV specific GPS. As a general matter I am planning to remove Buy and Don’t Buy recommendations from my Product User Reports in favor of simply reporting what I have found. I’m planning this change because I have come to believe that this is a subjective decision in many cases. That which makes a product seem great to me may not be important to somebody else or visa versa. Note: The RV760LMT has been superseded by the RV660LMT which has a smaller screen and a few new tricks. One of these appears to be a much improved manual routing-override when the map file may have insufficient or erroneous data. It also works with a new backup camera the BC-30. The specs of the BC-20 and BC-30 cameras appear to be the same with the only obvious difference that the BC-30 is compatible with more Garmin GPS units than the BC-20. In closing I will say this: I would much rather be with my RV760 GPS than without it! Despite its shortcomings–and every GPS unit has shortcomings–I never drive my RV without using it, the backup camera being one reason. All GPS units have shortcomings, you just have to learn to live with them. If you have found something on my blog useful or entertaining please Favorite (bookmark) this Amazon.com link and use it every time you shop at Amazon. Doing so will cost you no more and in some cases I may receive a small commission from Amazon. This blog takes an enormous amount of time and energy to build and maintain . Your support in the form of using my Amazon.com link will be greatly appreciated. Thank you. What follows is my original report on the RV760 LMT GPS. Much of the information in the original review has been duplicated and expanded upon in the re-write (above). In large measure the old review illustrates what can happen when a GPS has insufficient or inaccurate information about the weight limit of a road. These errors, although infrequent, made me unhappy with the unit. As I pointed out in the rewrite I have since come to conclude that the same kind of errors are likely to exist in other GPS units that consider vehicle weight and dimensions that use the same map data files. Garmin 760LMT RV GPS. DON’T BUY! 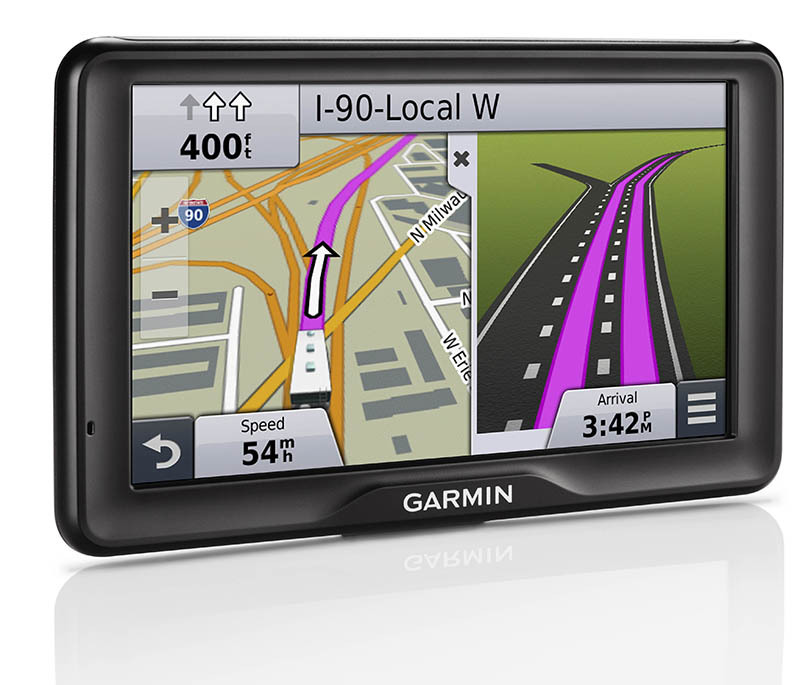 I’ve owned and used a Garmin RV 760LMT GPS for several months. This is a GPS made specifically for use with RVs. While it has a rich feature list of things it can, or should be able to do, in my opinion the main task of a GPS is to route you from point A to point B in an efficient manner. In this regard I believe the RV 760LMT GPS is a miserable, MISERABLE failure and my recommendation is don’t buy, Don’t Buy, DON’T BUY!!! There are plenty of web sites that will list the impressive feature set of the RV 760LMT GPS as specified in Garmin’s sales literature, but in my actual use some of these features fell flat on their faces. I mentioned above that a GPS should route you effectively from point A to B and here is where I have had a very big disappointment with my RV 760LMT GPS. Here’s one example: I was at the Grand Canyon Village at the south rim of the park where the visitor center is located and I wanted to head off to Page, AZ. According to Google Maps this is a drive of 133 miles if you follow the most direct route which is to head due east on AZ 64 to US 89 and head north. Rather than route me that way the Garmin RV 760LMT wanted to send me south to Flagstaff in order to pick up 89, just about doubling the length of the trip. Why would it do that? I think I figured it out. This is a screen capture from the RV 760LMT. 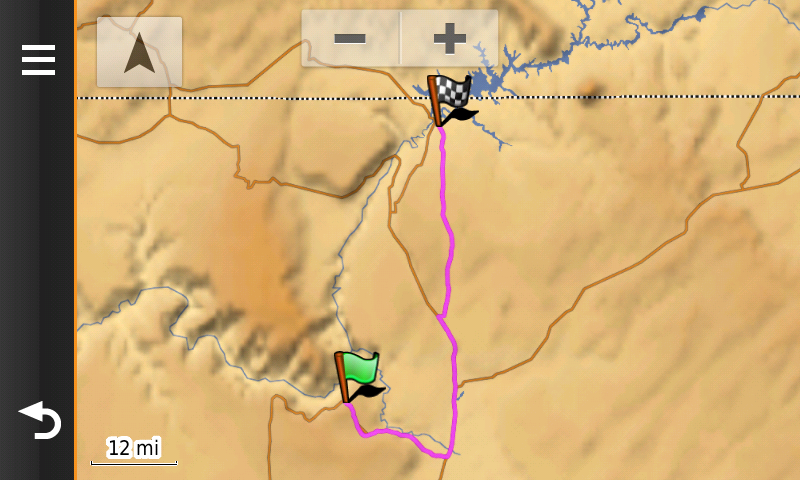 It shows what I believe is the proper the route from the Grand Canyon to Page, AZ for most if not all RVs. Mine wouldn’t route me this way if my vehicle profile weight was over a few thousand pounds. One of the features this GPS boasts is to pick routes based on the height, length, width and weight of your RV in order to consider overhead clearances, weight restrictions, etc. Now that’s pretty cool, or rather it would be cool if it did so properly, but it doesn’t. In order to find out why the heck the 760 wanted to route me south to Flagstaff rather than due east to 64 I did a little experimenting. First, in the settings where you enter the height of your RV I reduced the height of mine from 11′ to 1′, then I had the Garmin plot my route again. It still wanted to send me to Flagstaff. I then set the height back to 11′ and reduced the width of my RV from 8’4″ to 1′ and had the GPS plot the course again. Still it wanted to send me to Flagstaff. I made similar adjustments to the length of my RV and Flagstaff remained on the course. Finally, when I reduced the weight of my RV in the settings to below something like 4,000 pounds the GPS routed me east on 64. 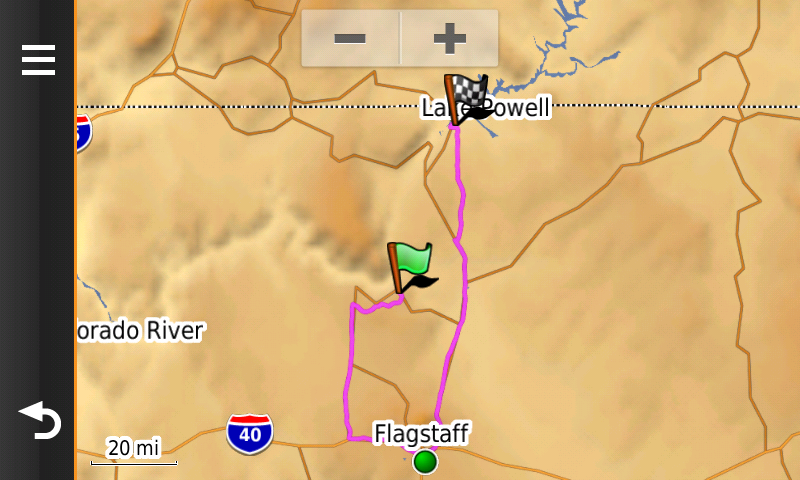 The obvious conclusion is that it had routed me to Flagstaff because it believed my RV too heavy to travel on AZ 64. But is it really? No, it’s not! AZ 64 is regularly traveled by RVs, buses, 18 wheel semi-trucks and all manner of high, wide, long and heavy vehicles. There is at least one RV park along the way, and there’s an RV parking area at one of the Grand Canyon tourist destinations along the route. I called the AZ department of transportation to inquire about restrictions on the route and they could find none that would prevent my RV, or longer, heavier and taller vehicles from traveling that road. It would appear then that this is a case of garbage in, garbage out; that Garmin has bad data programmed into their software regarding the route from the Grand Canyon to Page. Screen capture from the RV 760 which wanted me to turn off the only paved road around onto every unpaved road I passed including this one, Zeke’s Hole Road. 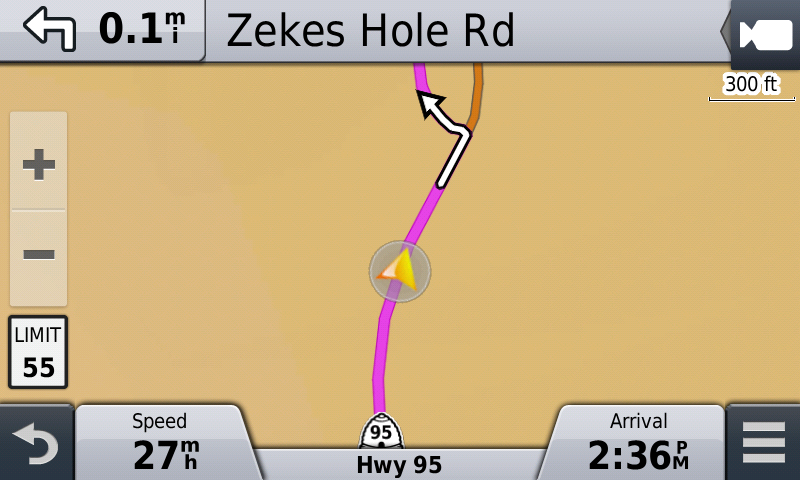 You’ve got to be kidding… turn off Highway 95 onto Zekes Hole Road? I don’t think so. Now, if that was the only time that the RV 760 provided me with a cockamamie routing it wouldn’t be so bad, but the fact of the matter is that it’s done this a number of times. Unless I reduced the weight of my vehicle in the settings it would try to route me down dirt roads instead of paved highways. I remember traveling from Natural Bridges National monument in Utah to Blanding Utah along route 95 which is the only paved road between the two locations if I’m not mistaken. The RV 760LMT kept barking instructions at me telling me to turn off 95 at each and every dirt road I passed. Yes, it wanted to route me off the only paved highway around onto dirt roads, some of them not even with names! It’s even given me instructions to turn onto non existent roads. This is bad, very bad. 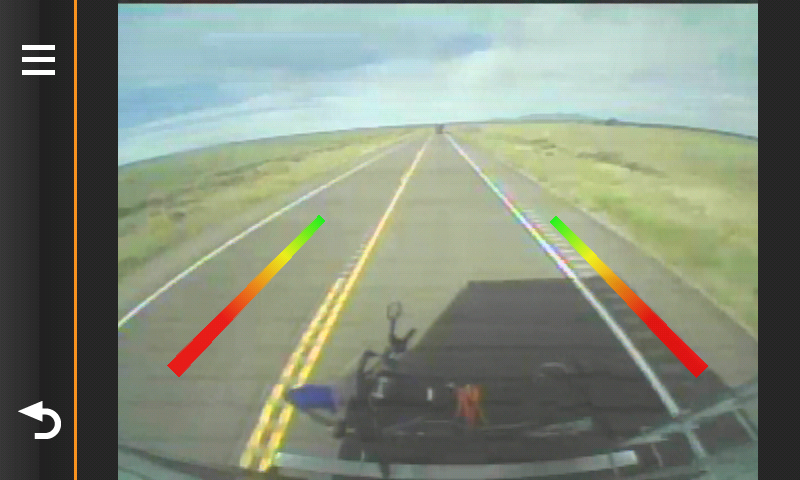 This is a screen capture from the Garmin BC 20 Wireless Backup Camera. IMHO the quality is lacking. Another reason not to buy this product. I also purchased the Garmin BC 20 Wireless Backup Camera to go with my RV 760LMT GPS. I am not at all happy with the quality of the image produced by the camera on the GPS screen and this is another reason to avoid thous product, in my opinion. Besides the issue of image quality, the BC-20 lacks any sort of shading device to protect it from rain (or other sources of water such as washing the vehicle), or sun. The picture produced by my unit in the rain became so blurry at times as to be next to useless, and when the sun hit it at certain angles the image it produced, likewise wan’t much help. I emailed Garmin to let them know about some of these issues and each time I got a very polite automated response saying that I’d be contacted within 3 business days. I never heard from Garmin. I could list more reasons not to buy this product as well as some reason’s you might want to purchase it, but when you consider that the device fails so miserably at the most basic level there isn’t much point in exploring beyond that. My recommendation as to the Garmin RV 760LMT which is based on months of actually using the product is DON’T BUY! Yes, of course. Thanks for that. Although I think most USB cables are probably interchangeable there is always a possibility of malfunction. My 760 3 years old. Used it 3 times. Updates always worked great. Except this year. When I plugged it into my computer the update program said unit not plugged in. My car & jeep Garmin units updated fine. After 2 1/2 hours up date program still couldn’t find my unit and then the word “system” appeared on my Garmin screen. It is located in the center of my screen & towards the top . The word drops down 3 lines and then goes back towards the top of the screen. It just cycles up & down. I have reinstalled the updater program & no change. My computer recognizes the gps because it powers it up. I have occasionally had issues where my device was not “seen” by a specific program on my computer or by my computer at all. Frequently I have found that restarting the device and/or computer resolves that sort of problem. It sounds like you have done that and more. I cannot troubleshoot this situation for you but I have on occasion found Garmin tech phone support to be helpful. You might try that if you haven’t already resolved the problem. Hi Russ. I have the Rv 760ltm. I have a truck camper and was wanting to get the bc 20 for a few years now, but want to make sure it’s worth it. I pull a small Atv trailer with the camper on and would like to check on it while traveling. My truck doesn’t have running lights but I would like to use the cam anytimenot just for backing up. Would I hook into a always Hotwire to make it work? I don’t want cam on all the time. Can you turn it off and on from the gps units in the truck? Sorry for all the questions. Unless you can supply power to the camera intermittently such as you would with a switch it will remain either on or off depending on whether or not it has power. There is no on/off switch. I’m not sure any of that matters, here’s why: you can switch back and forth from camera view to map view on the GPS by touching an icon on the GPS screen. It sounds like you should be able to use the camera the way you describe “anytime, not just for backing up” by giving it a constant source of power and switching views back and forth on the GPS. I wired mine to the running lights. I had to turn them on to supply the camera with power. Once they were on (which was all the time when I was driving) I would switch back and forth from map view to camera view via the icon on the GPS screen. Just be sure the circuit to which you hook up the camera is only hot when your truck is running or when you have turned on the accessories with the ignition switch. You don’t want the camera to drain your battery when your truck isn’t in use. HTH. GPS is their only business so they have to get it right to stay in business this long ! You wrote saying issues I reported may be “new user” issues. “New” is something of a relative term, of course… new compared to what? When I wrote my follow-up review I had owned and operated my RV760 GPS for some two years, much of that time traveling the US full-time in my RV and I had put it to the test over more that 20,000 miles under all kinds of conditions from major freeways, to two lane back roads as well as Forest Service dirt roads, for example. By then I had plenty of experience with the unit and it might be fair to say a good deal more than people who use their RVs more occasionally. I would have some difficulty imagining myself to be a new user. I think it may more likely be the case that be because of my extensive use of the unit I encountered situations that a less frequent user might never come across, thereby revealing more of the unit’s performance characteristics, both positive and negative. In my follow-up report I wrote, in part, “…the way it performs may be par for the course among GPS units, or in fact even better.”. I think I also wrote something to the effect that I continue to rely upon the unit despite its shortcomings… I still do. Whether or not any given person chooses to believe this device would be or was a good acquisition is subjective based on their own experience. The operational shortcomings I reported I believe were truthful and accurate just as my comments about the unit’s strengths and all based on considerable experience that included a significant amount of time working on issues I encountered with Garmin tech support. I don’t quite follow your comments about Bluetooth. Are you saying that the power cord of the GPS unit acts as the antenna for the Bluetooth signal sent from the camera’s transmitter unit to the GPS? Did someone at Garmin tell you that? I had the cord buried up above the windshield. They told me you can’t cut into that Garmin power cord because it is the Bluetooth connection. Maybe I was misinformed but they do this daily. By the way you expressed things it sounds like the power cord to the GPS unit may in fact also act as an antenna for the Bluetooth signal. That wouldn’t be something I’d expect necessarily, but I’m not really knowledgeable on such matters. I do know that wire can act as an antenna, so it wouldn’t be too surprising. Why did you mention cutting into the power cord? Were you thinking of shortening its length? Yes, initially I wanted to shorten it. It hung down to the cigarette lighter outlet for 7 months. Much cleaner look now. The unit works flawlessly. I have to say, however, that if your unit works flawlessly you’re the only one in the world that has a GPS of any brand that does so. LOL. I was staying at a Rv Park for a few days. Every time i would go to the same area it would route me in different directions. Some would be as little as 20 minutes while others would be 50 minutes. We are not talking cities with traffic, we are talking rural roads with no traffic in site. Then to compound the the problems with this unit, it tried to take me over a 3 ton limit bridge when my truck and travel trailer are programmed for 6 tons. Its not only a massive disappointment but a dismal failure and a outright danger. I will pursue getting my money back because like you said above, it fails at delivering the most fundamental function of this GPS. It’s my understanding that each map update seems to improve routing so do be sure you have the latest update. I’ve also heard it said that most if not all GPS units rely on the same data base, so, that weight limit problem you came across might also happen with other units. Despite the fact I gave a don’t buy recommendation I still use and rely on my RV760. I have learned to double check routings against other sources, Google Maps for example. I have found that at times I cannot rely on the RV760 for the best routing. It’s also virtually impossible, in my experience, to get it to take a route you know it’s OK to drive and want to take. The Blue Ridge Parkway for example. The unit would seek to route me off the road at every turn and I could see no way to override this, so I didn’t use the routing function when traveling the BRP. I still used the map function and back-up camera. Ok, thanks for the info and knowing this what would you buy to have these to features? I have not researched other GPS units, but as I recall, at the time I bought the Garmin the Rand McNally RV GPS was also on the market. I don’t recall if it had backup camera capability or not and I don’t know what you mean for certain by “these features”. I should update my user report on the RV760LMT. I’ve had one replaced under warranty because it wasn’t working properly. The one they sent to me isn’t working properly either and that one may have to be replaced too. Even with all the negatives is has some usefulness, but I tell you, at times it just doesn’t seem worth the hassle. Russ, I have a question on the Backup camera. How far away from the head unit is your transmitter? I am thinking of installing one in my 32 foot Fifth Wheel and wondering how close I will have to wire the transmitter to get a usable picture. My transmitter is maybe 25′ from the receiver. It is inside a cabinet in the bedroom in back. The signal has to pass through the cabinet door frame but other than that there are no obstructions between it and the receiver. That said, the Garmin set-up I have does not produce a very clear image even when the transmitter and receiver are within inches of each other. It’s good enough for most situations I suppose–barely–but it’s a pretty pathetic showing overall IMHO. The Garmin I have also has no illumination for nighttime backing-up or shield to keep un or rain off of it, both of which effect the already rather poor image quality. They may have made some improvements since I bought mine but don’t count on it. I’m not a trouble shooter for this product (or any other) but it seems something is obviously wrong. Have you called Garmin to see if they have any suggestions? I hooked mine up to the running lights. Sure thing. Keep us posted. Turns out, the tap connectors I was using were one size to large. The smaller ones worked. It now works great. What sort of problem did the tap connectors creat that would cause the symptoms you described? Just had one installed in my 32ft fifth wheel and cannot get it to stay connected. Camera goes in and out with a connecting message. It may be that the installation was done in such a way so that there is insufficient signal strength from the camera transmitter. Anything between the camera and GPS will degrade the signal to some degree. If it works sometimes and not others it could also be a bad connection. What happens if you bring the GPS close to the camera transmitter? If it works properly when you do that it would seem to indicate insufficient signal strength when the GPS is up front. That could be due to too many physical barriers in the transmission path or that it’s too far from the transmitter to receiver, or a combination of both. First I’d try bringing the GPS closer to the camera transmitter to see what happens. Garmin has telephone tech support which may help. The installer may not have done things quite right or there may be too much distance or interference. When I installed mine it didn’t work right at first because the receiver for my TPMS (tire pressure monitoring system) was too close to the GPS. When I moved the TPMS a couple feet away from the GPS it worked okay. Perhaps you have another wireless device interfering with the camera signal as did I.